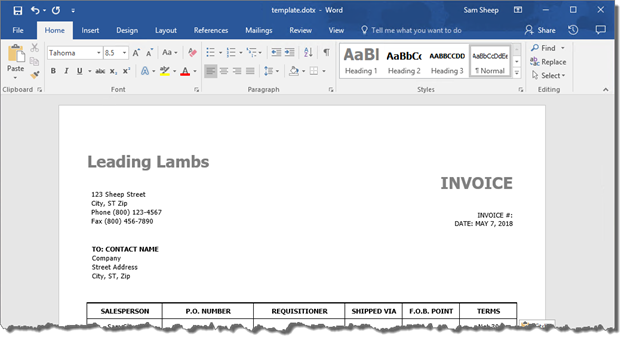 This step-by-step will help you add Word Quick Parts to your existing form template. This will allow your users to fill out the fields on the form and have those fields filled out in the corresponding SharePoint library. Users will still fill out the fields they always do when completing the form, but they won’t have to add the same information in again back in SharePoint. The first step is to make sure the library is set up. Our example library will exclusively hold invoices. This is important to know, as the content we want to store here will influence the site columns we’ll need to add in the next task. 1. In a web browser, navigate to the SharePoint site where you want your library to be. The site’s home page will open. 2. In the Suite bar, in the upper-right hand corner of the page, click the gear icon. The actions menu will open. 3. Click Add an app. The Your Apps page will open. 4. Click on the Document Library tile. This is normally found under Noteworthy, but you can search for it as well. Click the “Find an app” search box, type library, then press Enter. Matching results for “library” will appear. You can then click Document Library. The Adding Document Library dialog box will appear. 5. In the Name field, type a name for the Library app, such as Invoices. We’ll use the name Invoices for the rest of this document to refer to this new library. 6. Click Create. The Invoices library will be created, and you’ll be taken to the Site Contents page. 7. In the site contents listing, click Invoices. The Invoices library’s default view will open. 1. On the Invoices library’s default view, in the Suite bar, click the gear icon to open the actions menu. 2. Click Library settings. The Invoices library’s settings page will open. 3. Towards the bottom of the page in the Columns section, under the list of columns, click Add from existing site columns. The Add Columns from Site Columns page will open. 4. In the Select Columns section, under Select site columns from, select the site column group that your site column is categorized as. For this example, we’ll select the Secret SharePoint site column group. 5. 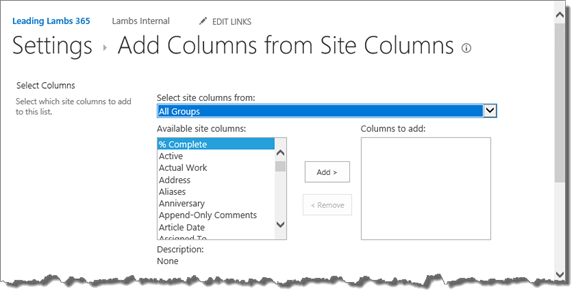 Under Available site columns, select a site column to add to the library. For this example, we’ll select Invoice #. 6. Click Add. The site column will be added to the Columns to add box. 7. Repeat steps 5-6 to add more site columns. For this example, we’ll also add the site column PO #. 8. When you’re finished adding site columns, at the bottom of the page, click OK. The site columns will be added to the Invoices library, and you’ll be returned to the library’s settings page. In the Columns section, the selected site columns will be listed along with the library’s default site columns. 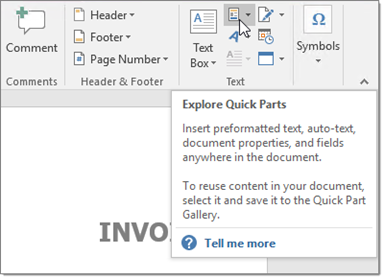 This task now walks you through editing the Invoices library’s default document template. If you already have a form designed and prepared, you can copy and paste the contents of the form into the blank Word document. Then we’ll show you how to add the Quick Parts to the template. Remember, any site columns we added to the library app will be called “properties” in Microsoft Word. 1. On the Invoices library’s settings page, under General Settings, click Advanced settings. The Advanced Settings page will appear. 2. In the Document Template section, under Template URL, click (Edit Template). Microsoft Word will launch, and a blank Word document will appear. 3. Design your form or copy and paste in the contents of an existing form. 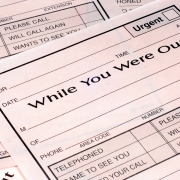 For our example, we already have our invoice form prepared, so we’ll copy and paste it into the blank Word document. 4. Click the Insert tab to open the Insert ribbon. 5. 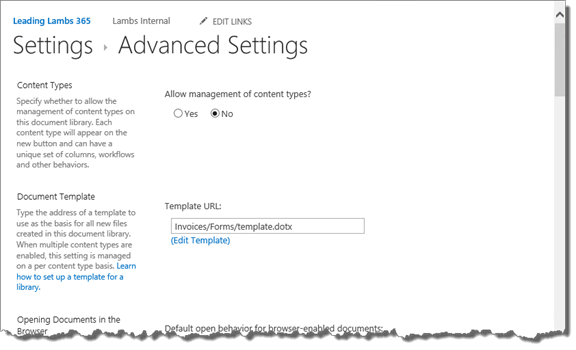 Find a location on the document that will contain the information you want to send to SharePoint. For our first example, we’ll use Invoice #, which is found in the upper-right corner of the form. Because we want to place invoice numbers to the right of Invoice #, click the area to the right of Invoice # to move the insertion point there. If there is existing placeholder text, delete it now. 6. In the Insert ribbon’s Text section, click the Explore Quick Parts icon. The icon looks like a page that has multiple boxes of content in different colors. The Quick Parts menu will appear. 7. 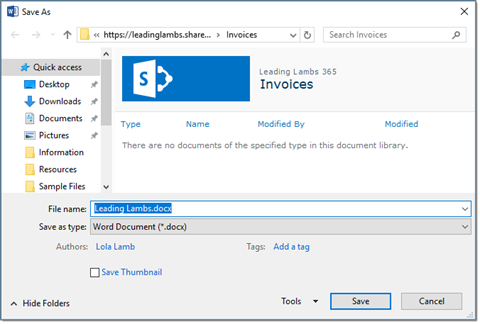 Hover over Document Property, and a list of the document’s properties will be displayed. You should see both the default document properties, such as Author, Title, and Tags, as well as the names of the site columns that we just associated to the library. 8. Select the site column you want to add as a Quick Part in the document. For our example, we’ll select the Invoice # site column. The Invoice # site column will be added to the form as a Quick Part. It’ll be displayed as a gray text box with the site column’s name in square brackets, such as [Invoice #]. 9. Repeat steps 5-8 to add other Quick Parts to the form in the desired locations. For our example, we’ll also add the PO # site column. Our location for purchase order numbers is in the table on the middle of the page, under PO#, so we’ll click the blank table cell, then select PO # from the Quick Parts menu. This will add the PO # Quick Part to the form. 10. When you’re finished adding Quick Parts to the template, save the template. If you’re using SharePoint Online, you must save the template as a new name. Start by clicking the File tab to open the Info screen. 11. Click Save As. The Save As screen will appear. 12. Under Current Folder, click Forms. The Save As window will open. 13. In the File name field, give a new name to the template. For this example, we’ll use the name Invoice. 14. Click Save. The Save As window will close, and the template will be saved in the Forms library. 15. Now we need to set our new template as the library’s default template. Close Microsoft Word. 16. The Advanced Settings page should still be visible in your browser window. In the Document Template section, under Template URL, delete template and replace it with the new name you just gave to the template. The Template URL field should read something like Invoices/Forms/Invoice.dotx. 17. At the bottom of the Advanced Settings page, click OK. You’ll be returned to the Invoices library’s settings page. 18. To return to the Invoice’s library’s default view, at the top of the Invoices library’s settings page, in the breadcrumb bar, click Invoices. You’ll be returned to the Invoices library’s default view. This final task will show you how information added to the Quick Parts will be added to SharePoint without typing the information twice. You can instruct users to use these steps whenever they fill out their form. 1. On the Invoices library’s default view, in the command bar, click New. The New menu will appear. 2. Click Document. Depending on your library’s settings, Microsoft Word will launch, and the default document template will open. Note: Depending on your library’s settings, Word Online may launch. At the top of the Word Online screen, click Edit in Word. The We’re opening this in Microsoft Word… dialog box will appear, and Microsoft Word will launch. 3. Fill out the fields of your form. 4. When you get to a field that contains a Quick Part, you’ll see a gray text box with the name of the field in square brackets, such as [Invoice #]. To fill out these fields, click into the Quick Part, then type the information. For the Invoice # example, we’ll type LL-001. 5. Repeat step 4 for every Quick Part in the form. For our example, we’ll also fill out the P.O. Number field. We’ll click the Quick Part, then type PO-100. 6. 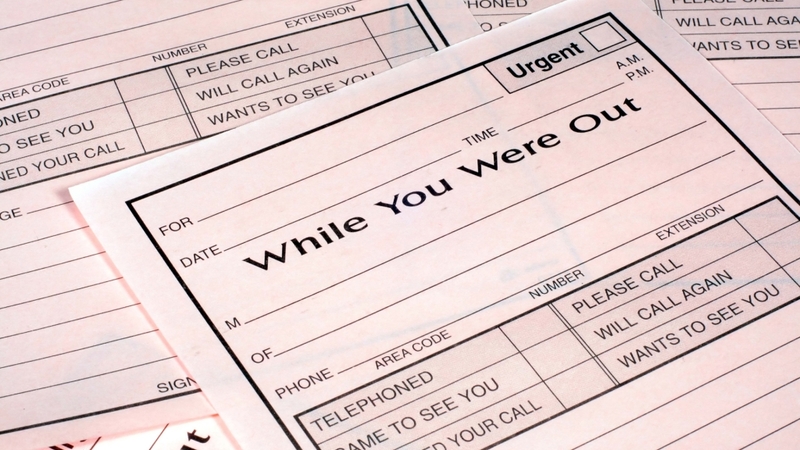 When you’re finished filling out the fields, save your document. Click the File tab to open the Info screen. 7. Click Save As. The Save As screen will appear. 8. Under Current Folder, click Invoices. The Save As window will open. 9. In the File name field, give a unique name to your document. 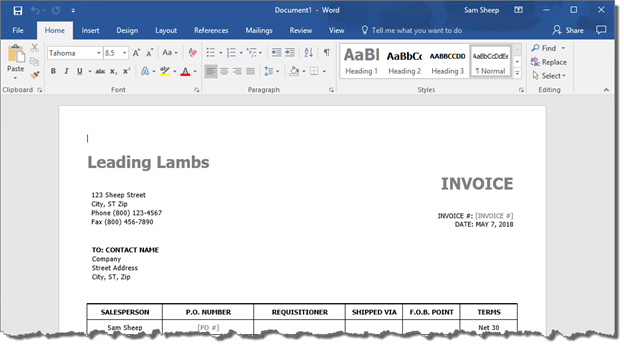 For this example and for the rest of the document, we’ll use the name Invoice LL-001. 10. Click Save. The document will be saved to the Invoices library, and the information you entered into the Quick Parts will now be added to the site columns of the document library as properties of the document. 11. Close the Word document. If Microsoft Word was initially launched instead of Word Online, your browser window should show the library’s default view. Note: If Word Online was originally launched, you should see the Word Online window instead of the library’s default view. To navigate back to the library app, in the Suite bar to the left of the document’s name, click Invoices. You’ll be returned to the library app’s default view. 12. 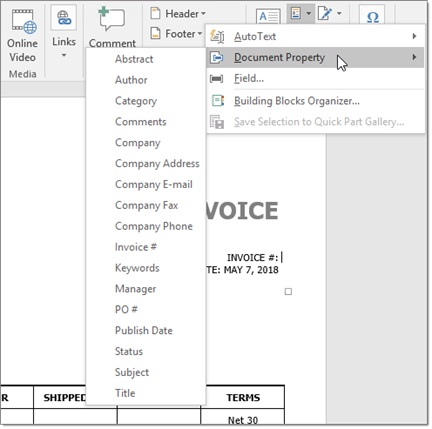 Your document will appear in the item listing with the metadata populated in the columns. For our example, you’ll see the Invoice # field contains LL-001, and the PO # field contains PO-100. I have followed the steps, but when I create a new document, it’s opening as a blank document instead of with the new template. I go back into the settings and open the template and it’s showing the way that I want it to. Any ideas what could be causing it to not show the template correctly? I’m using SP2016 on-prem.